In fact this beautiful Somerset wedding was threaded right through with something blue, as the bridesmaids quickly pointed out. From the gorgeous letterpress invitations by Sydney designers D&D Letterpress through to the personalised votives at the wedding breakfast – Lucy and Matt’s love of bright blue Portuguese tiling was echoed throughout the styling. This was the union of an English groom and an Australian bride – both with blossoming careers in the airline industry – and as such they also share a love of travel and discovering new and beautiful parts of the world together. Lucy has to be one of the most caring, kind and thoughtful brides. Helping the bridal party to find their shoes, checking if I needed a drink – all whilst getting herself ready and maintaining her composure when the schedule ran a little tight and the wind whipped her hair. This kindness was also spoken about by her maid of honour, who declared that she knew no other person who could rally so many friends and relatives to fly in from the Antipodes for a one-day event! Matt was equally thoughtful, putting his guests and the smooth running of the day ahead of himself long before laying his hands on a well-earned cold drink. This couple’s wedding was simple, stylish and, above all, a huge amount of fun. Laughter was the order of the day – with a relaxed ceremony, joyful family reunions and side-splitting speeches that made it tough to hold the camera still at times. From the outset Lucy chose to hire local and regional suppliers. The wedding featured a classic floral colour palette of green and white with pink accents, with lashings of greenery and seasonal English flowers, delivered and arranged by Bloomingdales Flowers. The cake from The Bakemonger was a sight to behold – a towering multi-tier semi-naked cake heavily adorned with edible gold ribbon, dried fruit slices and fresh figs, grapes and blackberries. Thank you Lucy and Matt – together with both of your families, and the bridesmaids and groomsmen – for not only entrusting me with the honour of capturing your wedding, but also for truly welcoming me as one of the family. I loved every moment of your day! Thank you for putting your trust in me and in film, and for choosing fine art photography. 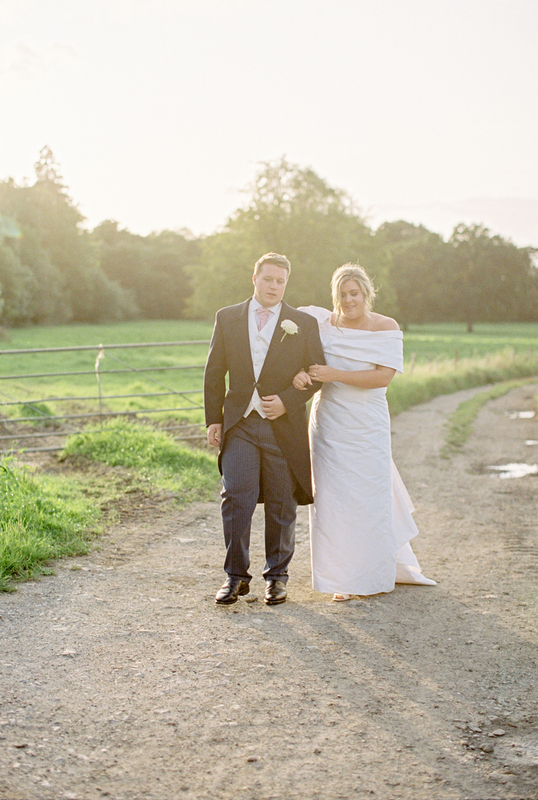 I shot much of this luxury Somerset wedding photography on film for its timeless beauty, and the sun shone for some stunning golden hour portraits.